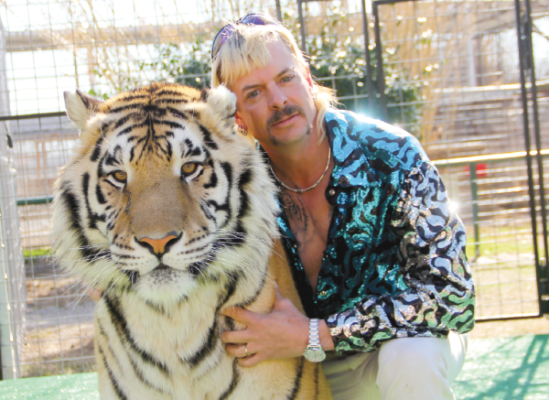 I hope Joe Exotic enjoys being confined to a cage! The U.S. Attorney’s Office has filed new charges against the man known as Joe Exotic. Federal prosecutors say Joe Maldonado-Passage, who’s already accused in a murder-for-hire plot, killed five tigers and illegally sold cubs. “My point is it’s never okay to take a shotgun, put it to a tiger’s head and pull the trigger,” said Jeffe Lowe owner of Greater Wynnewood Exotic Animal Park. According to court documents Maldonado killed multiple cats to make room for others. “We found out Joe needed to clear cages to rent cages to another friend who owned a circus. Joe stood to make money by renting those cages out,” Lowe said. Hmmn. Joe killed cats to make room for other cats? I’m starting to wonder if he had the same process when it came to his husbands! Anyway, you can read more about this over at News 9. According to an Ogle Mole that I swear is not Joe Exotic or Tony the Tiger, I’ve heard the FEDs murder-for-hire case isn’t as strong as they’d like, so tacking on more indictments shouldn’t be a surprise. Wow! That’s going to look bad on his resume in the next Governors race. This is Oklahoma we’re talking about. If he runs as a Republican, he very well could make the general election. That could happen. He was protecting Oklahoma from the danger of wild tigers that he shipped here and it was his right to kill these animals under the second amendment so they won’t form a caravan to come eat the innocent women and children. I’m being sarcastic of course. But it might sell. *pregnant women and unborn children. Outside of that, they can fend for themselves. Didn’t Rep Shortey already try to ban fetuses from being served in restaurants? I guess the OK politicians now need to try to ban fetuses as tiger food. It makes as much sense as some of the things they have tried in the past. An astonishing number of Oklahomans skip the benefit of thought process and vote the straight Republican ticket. If Joe gets as far as the Republican nomination for governor, he would probably win the general. I have to agree with you,though I wish it wasn’t the case. I’ve been around long enough to see politics evolve. The Mueller investigation was never about Trump, it was an investigation into interference from outside states or organisations into our election process. I hope we can recover and get back to good government. Sorry, I had a brain fart and unloaded some national political stuff that doesn’t belong here.